"When Benazir died, I started calling her by the nickname we used all those years ago: Wadi Bua, which in our dialectic in [the] Sindh [province] is a term of endearment for father's elder sister. I don't know. It was just natural, spontaneous. All of a sudden, she stopped being the political opponent of recent times and went back to being the Wadi Bua of my childhood games, when I was five and she was thirty-five. They tell me she was killed by a bullet in the neck. Just like my father Murtaza, her brother. I've sort of suspended judgment. I've stopped accusing her of complicity in his murder in 1996. That was Benazir when she was alive: the bad aunt, the corrupt, unscrupulous feudal leader who stripped us of everything out of sheer lust for power. Now she is Wadi Bua again: my flesh and blood, another murdered member of the family, all to be mourned together -- without distinction." Fatima Bhutto speaks steadily, without pausing. Sometimes she sounds like a young girl: younger than her 25 years. At other times, it is a responsible, mature politician who speaks, justifying her widely held reputation as a "true Bhutto": a label that she would rather see avoided out of respect for her ideal of a "truly democratic Pakistan" and her hostility to the "logic of bloodline succession." Speaking from the Bhutto family residence at Larkana a few weeks ago, she told me that it was too soon for an interview. "I don't want my well-known differences with my aunt to be instrumentalized," she said. But now, back at her home in Karachi, she is prepared to answer questions over the phone. 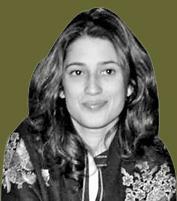 Fatima, also a journalist, is well aware that the power games within the Bhutto family are becoming a major story worldwide. What does she think about the succession to the leadership of the Pakistan People's Party (PPP) of Benazir's husband, Asif Ali Zardari, and the couple's eldest son, her cousin Bilawal, who has returned to Oxford for now? "Dynastic succession is a danger that undermines efforts to bring democracy to Pakistan. Candidates should be elected on the basis of their programs, not their bloodlines or the support of their families. But I always steered clear of the infighting in Benazir's Popular Party. I support the party founded by my father in 1995, the People's Party Shaheed Murtaza, which is represented in provincial assemblies but not in parliament. Our party is secular, socialist and anti-imperialist, like the one my grandfather Zulfikar founded. It has nothing to do with the pro-Americanism of Benazir's group. We are progress; they stand for the conservative interests of the big landowners. I admire people like Barack Obama, whom people support for his personal merits. Certainly not Zardari." "I don't know. There are so many players. You have to look at who benefits from her death. For Musharraf, it was a serious defeat. Despite their political differences, they were allies, with American support. I don't think he has anything to do with it. It could have been Islamic extremists. But the fact that Bush says so weighs against that theory: he's always wrong. Recently, Benazir seemed to have distanced herself from the Americans and they may have ditched her, leaving her more vulnerable. It looks like the real beneficiary is Zardari." Isn't that a crazy idea? Bhutto murdered by her husband? "I don't know. No one has ever produced the famous will on which Zardari bases his right of succession. He is certainly not popular. I'm expecting attempts to overthrow him. But I don't want to say any more. My life and my brother Zulfikar's are at risk." Some observers point to Zulfikar as the legitimate heir because he is the son of the PPP founder's eldest son. Have you ever discussed this with Bilawal? "I know: The reasoning is absurd. I've been told I should be a transitional head of the party until Zulfikar, who is 17, reaches the age of 25 and is eligible to be a proper political leader. All this in the name of the male-dominated, medieval tribalism that holds sway in Pakistan. I would never accept it. In any case, I haven't talked about it with Bilawal. We saw one another at the funeral and prayed together. That was all. We don't keep in touch." Is it true that civil society in Pakistan has developed much more under Musharraf than it did when Benazir was in power? "I have no doubt about it. Media freedom has made gigantic strides in the past seven years. Benazir's two governments were autocratic and corrupt. And I would have kept on telling her so if she were still alive. But she is dead and her end is a tragedy, a catastrophe for us, her family, and for the entire country." Lorenzo Cremonesi is a correspondent for the Italian newspaper Corriere della Sera. The above interview first appeared in the Jan. 15 edition of Corriere della Sera. The English translation is by Giles Watson.